The concept of Web OS – having all your applications and data available on the web through the browser irrespective of the hardware and OS of the system you are using – and its requirement is understood for quite some time now. But there haven’t been any good implementations. Recently I discovered Goowy. And I was amazed. Though it is still far from becoming a Web OS, they have done a pretty good job packaging the entire thing with an interesting user experience. Email – you get a @goowy.com address with 2GB space. Small applications like Stock ticker, weather monitor, Flickr viewer, Google Search etc. The Mac-like application bar at the bottom of the website makes the intention of Goowy developers clear – it’s gonna be the web equivalent of a desktop OS. The fact that folk at Goowy decided to use Flash instead of AJAX to provide the “rich internet application” experience seems to have paid up. However, all this doesn’t come free of cost. The load time for Goowy is slightly on the higher side – all those nifty animations need higher bandwidth than what would have been required for a simpler AJAX implementation. 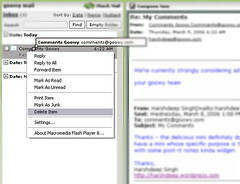 There is a lag in entering text while composing an email, even on my super powerful workstation. I’m sure the developers at Goowy are working full-steam to add new features to their wonderful app. There is so much for them to do right now. Some features are already in the pipeline – they are just grayed out on the main page – like sharing files and instant messaging. 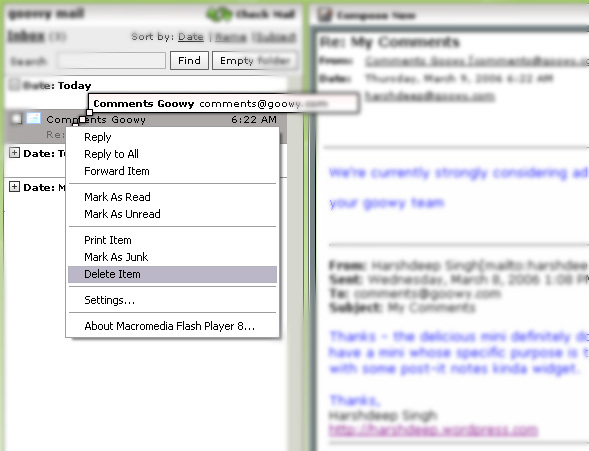 I don’t know how Techcrunch got the screenshots of IM working in Goowy. I’d like to see widgets for storing bookmarks. Also, some kinda post-it notes would be very useful. But the most important feature would be to somehow allow third party developers to develop widgets/applications for their site. I’m not sure how they should be doing that but if they can get the attention of third party developers, the usability and acceptance of Goowy will increase a lot. And yes, resizable windows for minis would be a nice improvement. I really don’t get this. Can someone explain why a web-based desktop is a good idea ? I don’t spend all day looking at my desktop – it’s in the background while I’m using email or using word or emacs. Shouldn’t we be working on developing web Applications rather than web Desktops ? You could also try eyeOS. Post-it notes are there and some other stuff as well but still in beta. Not flash based. Web OS? In what way is this an operating system? Now this could be interesting; I’ve invested too much into my OS (MEPIS Linux) to give it up, but I think this could be a pretty good model for one of those “social” websites like myspace.com. @Walter: Web Desktop is useful because it allows you to have your bookmarks, to-do lists, rss feeds, calender and contact list available to me on all the machines you use. You don’t want to keep updating these lists everywhere. 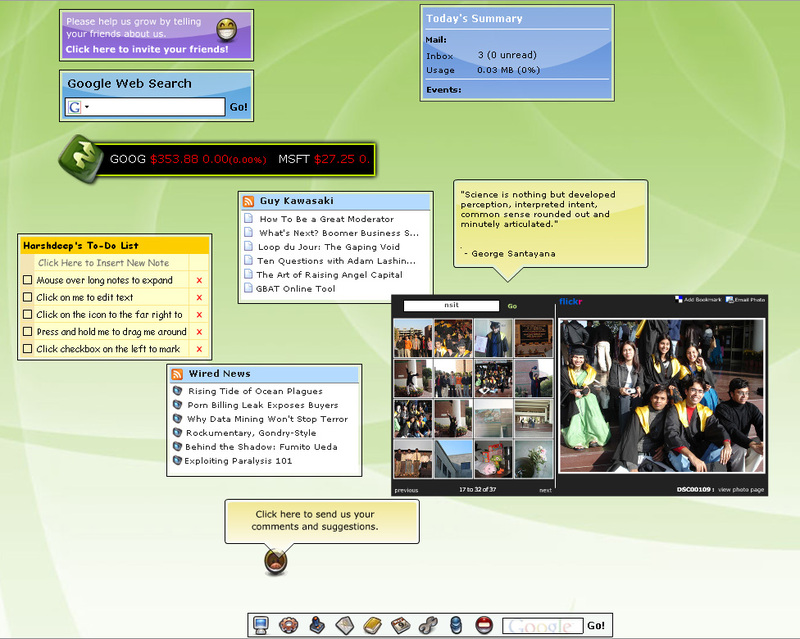 But Goowy is not just a Web Desktop, I think it’s more of a Web OS. @Anshul: eyeOS is kewl! I just looked at it briefly and I think it rocks. Will take a closer look tonight. @James: Ideally, a Web OS would let me have a set of web apps and the content generated/used with these apps on any machine I login from. That way my “work space” looks the same no matter which system I’m using. Goowy, as I said, is not completely a Web OS but it’s the closest thing I’ve seen to that. I think I’ll write another post about my understanding of a Web OS. @misterdubs: It’s much more beneficial if you use multiple systems (possibly with different OS). Anything based on proprietary systems is, by definition, not web-enabled.